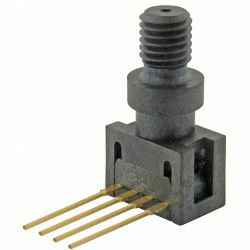 26PC Series, compensated/unamplified, gage, 0 psi to 30 psi, 1x4 SIP 15,2 mm [0.60 in] long, 1/4-28 thread The factory calibrated 26PC Series miniature pressure sensors provide reliable gage pressure sensing performance in a compact package. The sensor features a proven sensing technology that utilizes a specialized piezoresistive micro-machined sensing element which allows part interchangeability, high performance, reliability, and accuracy. The low power, non-amplified, non-compensated Wheatstone bridge circuit design provides inherently stable mV outputs over 1.0 psi through 250 psi sensing ranges.